A description of the Reclaimed, Recycled and Salvaged woods available at Architectural Timber and Millwork. With a large standing inventory of reclaimed and salvage lumber we are able to provide a wide range of antique building materials for most projects. Because we maintain an ongoing relationship with various wood salvage operations we are able to locate difficult to find items as well. Custom sawing, surface and profile planing, and kiln drying are also available on a project by project basis. Antique Wood? Reclaimed Wood? Salvage Wood? Which is it? As the use of recycled wood from obsolete buildings has become more mainstream there has been a growing casual use of the various terms describing this wood and the processes used to acquire it. Often these terms are used to described any wood recovered from a building of any age. But the term "Antique Wood" is more accurately reserved for the wood coming from buildings of greater age, 75 years is a typical age for true antique wood. "Salvage Wood" is best described as wood that has been purposefully and carefully removed from a building slated for demolition. This will include wood recovered from newer buildings as well as older buildings. "Reclaimed Flooring" is typically a reference to flooring carefully removed and denailed for reuse as flooring. This term would apply equally well to antique wood removed from a colonial era home as well as modern strip red oak from a suburban ranch home. Beams of various dimensions and species are a standard stock item. This material typically comes from dismantled agricultural buildings or 18th and 19th century factory buildings. Farm buildings are normally built from indigenous trees located within a short trip from the location of the barn being built while the early factories are more often constructed with east coast commercial lumber species, often being shipped hundreds of miles, such as Long Leaf Yellow Pine, Eastern White Pine and after the completion of the transcontinental railway in 1869, Douglas Fir from the west coast. Joist material in 2", 3" & 4" depth sawn from various species is a typical stock item that has great utility in the re-manufacturing of recycled woods. This material will often be sawn without the center of the tree (Free Of Heart Center or FOHC) occurring within the piece of wood. This condition avoids the heavy checking that forms in a beam that has the very center within the timber (Boxed Heart.) Consequently the boards sawn from these FHOC joists will yield a much higher percentage of wide boards. ATM also has a large supply of professionally sawn board stock acquired from the resawing of our antique reclaimed beams. 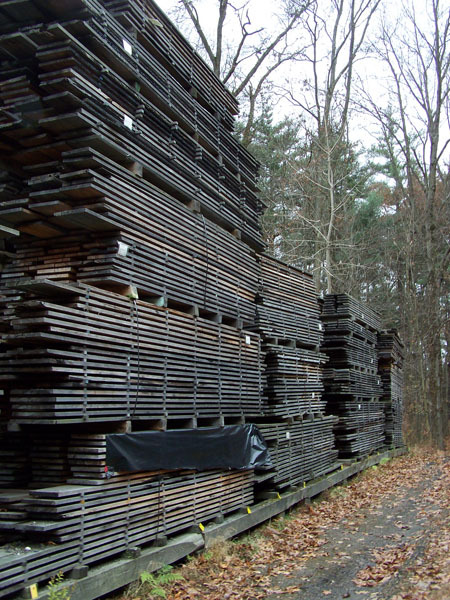 There are substantial quantities of resawn antique White and Red Oak, Chestnut, Long Leaf Yellow Pine, Northern Yellow (Hard) Pine, Eastern White Pine, Hemlock and Spruce available. Our sawyer is able to saw our reclaimed wood to any specification needed in your project. Boards recovered from turn-of-the-century agricultural buildings typically are identified by either color or the location within the building where they were once used. Terms such as threshing floor, granary boards, roof board or siding are often used to describe barn boards. In addition these boards may be sold according to color or patina such as brown board (board from the interior or the side of a board that was facing inside), grey board (a board or face of a board that was directly exposed to the sun and weather) and sometimes even by paint color such as chipped white or chipped red.